I really like the look of these with the white outside and the walnut "inlaid" baffle. Excellent WAF. To me this sound bar seems like an "all in one 2 fronts and a center" speaker where as when I think of soundbar from commercial vendors I think "a long speaker that does all kind of fake surround sound magic". That is a great question. I should mention I have actually updated the crossover and I will upload those changes, maybe even later tonight. However, to get back to your question, this really is just a left and right channel (AKA stereo). There are some soundbars that have a surround sound processor in it and will even use a dedicated microphone to get the levels correct. They really are ingenious. However those cost a lot of money, typically over $1000 (yamaha always made some really unique soundbars). But most budget soundbars in this price range are typically, just 2 full range drivers (ie left and right) and occasionally they couple that with a subwoofer. So even though the grill looks like there is a lot of speakers, there typically aren't many in there and they do not have a surround sound amplifier built-in. However, so of them have a simulated surround function, which in my opinion doesn't work well at all. However, I am sure there are people out there that like them. So unless you are buying a high end sound bar, you are only getting a 2 channel or 2.1 channel setup in the shape of something that fits under your television. There may be a way to get a dsp engine that would create a simulated surround, but I think most people would be happy with just the 2 channel soundbar. Some (most?) receivers these days will attempt to recreate some surround effects using just front speakers. It's what I plan to do when I build a soundbar for my bedroom. That is a great point! If you wanted to use a surround sound receiver to power it instead of an amp board, there are a lot of advantages to it. If you are using a HT receiver I think you could achieve this by simply adding an additional set of speakers to the center portion and setting the receiver's rear channels to phantom. My concern would be with how close the three channels would be physically and how that would affect the perceived channel separation. I have been toying with the idea of making a passive version of the new outrageously expensive Creative Labs soundbar. My Marantz receiver has the Audyssey calibration system and I am curious how it would handle the delay on the rear channels with them located similar to the layout of the Creative soundbar. The only other option would be to use a DSP and multiple amplifiers and then you would still need a processor to provide the separate channels which would get expensive quick. Fortunately it appears that there are a lot of DSP options that are slowly coming available to DIY. Lo and behold. The groundbreaking Creative X-Fi Sonic Carrier is a nexus of technology and design that will upgrade your home entertainment experience. I cant wait to see what you come up with. What drivers are you looking at using? I have only been toying around with the idea by mostly cannibalizing existing designs using the B3N driver but it definitely seems doable. Unfortunately is was in a pretty severe car accident in February that has limited me from doing anything physical for another 2-3 months but once I get to where I can start making sawdust again I may actually pursue the idea. I completely agree that it is something the DIY could/would really use. Altoid, that's an amazing build. Many kudos! I've also been toying with the idea of a sound bar as well; I have a bunch of the ND65-8 and ND16FA tweeters. I have a (possibly newbie) question about the xovers: What are your thoughts on just adding a high pass filter on the tweeter? I figured, the ND65 has a drop after 10k and figured I'd take advantage of that by omitting a filter on that end. I have a living room that had a really cheap Samsung sound bar that we picked up with a gift card a few years back. 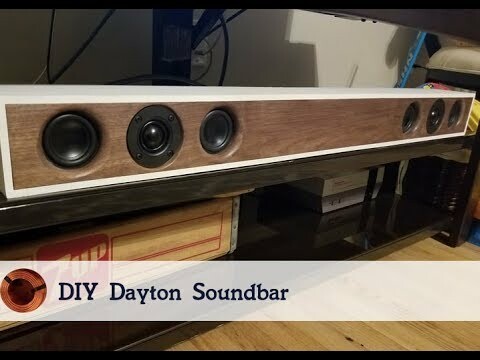 But I have always wanted to design and build a soundbar from scratch. So recently I did just that. Last edited by Clancy45; 03-01-2019, 03:49 AM.